THE MAGPIE SALUTE is a rock band made up of some former members of Black Crows: Rich Robinson, Marc Ford, John Hogg, Sven Pipien, Joe Magistro & Matt Slocum. When artists get to the point in their careers when they are making music because they want to make music, and the worries of making it, gaining followers and wondering if they will be accepted by the “music community”…That’s when some of the most creative music is made. They are out on a European/US. tour thru summer (2018), fall and winter, with stops in: Berlin, London, Charleston, Nashville, Boulder, Grand Rapids, NY, Atlanta and more. Check their complete tour schedule for the city nearest you. That’s exactly where The Magpie Salute is coming from – They are making great music because they can. Not because they have to. No pressure to prove anything to anyone. This is music freedom at it’s finest! 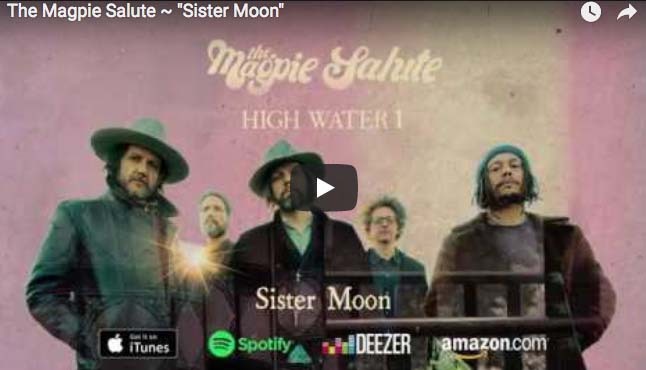 “Sister Moon” is on their new album ‘High Water I‘, which will be available on August 10, 2018. (Pre-order is available now). Be sure to connect to The Magpie Salute thru their website, TWITTER, FACEBOOK and INSTAGRAM.